The Red and Blue Palace! I have enjoyed raising chickens for several years now. They are very low maintenance and are much easier to take care of than a dog! If you are interested in raising backyard chickens for eggs or meat, there are a few things you should know before beginning. First, you will want to check with your city to see if your area is zoned for chickens. Most areas are catching onto the chicken movement and allowing people to raise their own. In West Jordan, where I live, we are allowed to have 5 hens and 4 chicks. I have 5 hens at the present time. 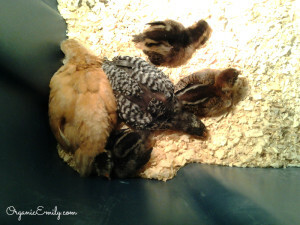 1 Buff Orpington, 1 Barred Rock, 1 Easter egg-er (Americana), 1 Sussex and 1 Sliver Laced Wyndotte. Other types of excellent layers are Red Island Red, Welsummer, Delaware and Black or Red/Gold Stars. I got my particular breeds in the hopes to get different colored eggs and have a variety of hens (mostly to tell them apart). I get a variety of colored eggs from green/blue to light and medium browns. Above is a picture I took while they were still babies under lights indoors, over a year ago. Certain breeds lay more prolific than others. You may also want to take into consideration the temperament of the breed. There are some great resources to find the right breed for you. www.backyardchickens.com is an excellent website and forum that I frequently visit. They can give just about every answer to every question you may have. I also purchased a magazine called CHICKENS at my local farm store (CAL-Ranch or IFA). In there has a list of chicken breeds, size and color of egg, temperament, weight, origins, etc., along with other wonderful ideas and tips on how to raise your chicks successfully. People always ask me if chickens are difficult to raise. They are a very low maintenance animal to take care of! I clean the coop and run about once a month. They are not only beautiful and fun to watch, but have great personalities and don’t get into trouble! One of my hens loves to let me know she has laid an egg, by clucking her “I just laid an egg song”. She likes to shout out to the world when the other girls have laid too. A proud moment of the day I suppose! :) Chickens need other chickens! A minimum of 3 in a flock or preferably more will keep them happy! Don’t be alarmed if you see a little pecking going on. It’s normal and a pecking order needs to be established. Now if you see blood being drawn then that is another story. The mean bird may have to be removed from the flock if it continues so the other birds don’t follow her example. I give my girls 4 sq ft each in the coop (separate from the nest box space (which should be 2sq ft, 4-6 inches off coop floor)) and 6 sq ft each in their run. The more room a hen has, the happier she will be! We enclosed our run with the coop just because there is a gully just south of us that brings down all sorts of wildlife from the mountains. We did it that way so we don’t ever have to worry about the safety of our chickens from predators, especially at night. Chickens need to be able to perch up higher off the coop floor to roost for the night. A bar or 2×2 piece of wood will do, reaching from wall to wall. Under their roosts, where they sleep, I have a tray (old wooden window box) placed underneath the roost to catch their poop. I then gather it up about every 2 weeks and throw it into my compost pile. Chicken manure has a large amount of nitrogen and is an excellent organic fertilizer! Be sure it has broken down completely before using or it can burn your plants. I don’t allow my girls to free range while my garden is growing, but they are able to get out in the fall through the early spring, just about every day. There are some great blue prints of chicken coops on the website noted above. Chickens love treats! And they love to scratch (digging around for bugs, scraps of food or something fun to play with)! I often give them all my left over table scraps, excluding meat (which is rare in our home), eggs, onions (because they don’t like them) and garlic. My girls don’t particularly care for cabbage either, but yours could be different. I also offer them a scratch block from the farm store to keep them busy. The majority of the work is done within the first 2 months of raising your chicks. The babies need to be fully feathered before going outside, this takes about 8 weeks. You will need a warm light, water and food source and pine shavings to put down for them to walk on, poop on and sleep on. I find that I need to change out their little space every other day to prevent my house from smelling. The chicks need a light that will provide 95 degrees when you first bring them home. Every week pull the light away about 5 degrees until they don’t need it anymore at 70` (if you keep your house that warm). Once fully feathered you can put them outside given that it’s not to cold, while providing a light source if they need it. …And then there is the coop. 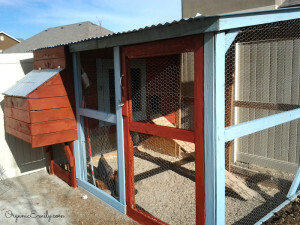 Building the coop can be a fun project for the entire family. Have fun with your new adventure into the world of chickens and get them used to you by holding them gently and giving them lots of love. Please feel free to ask any questions about raising chickens in your backyard!